Kilmanahan Castle, County Waterford was discussed here early last year (Shrouded in Mystery, January 9th 2017). Built on the banks of the river Suir almost directly across from Knocklofty, County Tipperary the house has at its core a mediaeval castle erected by the FitzGeralds. In the late 16th century the land on which it stood passed to Sir Edward Fitton, and then a few decades later to Sir James Gough, before changing hands again in 1678 when acquired by Godfrey Greene. His descendants remained there until the mid-19th century when the Kilmanahan estate was sold through the Encumbered Estates Court. By the start of the last century it had been bought by the Earls of Donoughmore whose main residence was the aforementioned Knocklofty. As their fortunes declined, so too it seems did those of Kilmanahan. In June 1984 Suzy Roeder, an American visitor to this country, stayed in the area and went to look at Kilmanahan with her hosts. While there she took the photographs shown today, which give an idea of what the place looked like more than thirty years ago: at the time, it seems, the interior of the castle was being used to store cattle: they were in occupation of the courtyard at the centre of the building. This was by no means an unusual fate for such properties. Local farmers would buy the land without having an interest in any structures then standing and accordingly put them to practical use. What makes these photographs especially interesting are the views they offer of the interior of Kilmanahan Castle. Those portions of the building that were accessible still retained at least some of their original decoration and show that the Tudor-Gothic style prevailed here as in so many other similar properties refurbished in the decades before the Great Famine. 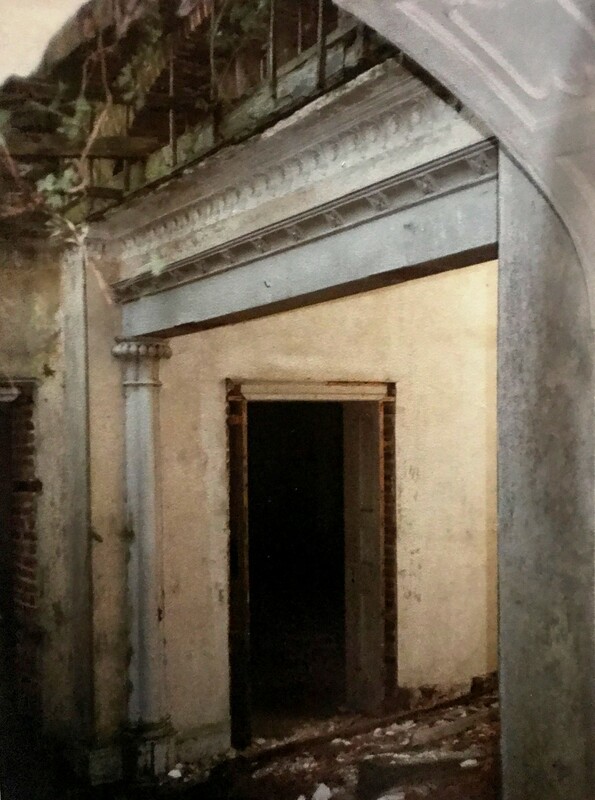 At the same time, there are elements of earlier classical plasterwork which also lingered (note the great arched window mid-way up the since-lost staircase), demonstrating that Kilmanahan’s rooms had been overhauled at some point in the 18th century. Impossible to say what, if anything, remains today. Although the castle still stands, one suspects that in the intervening thirty-four years the elements have taken further toll and the interiors are still-further stripped. With thanks to Suzy Roeder for sharing these images. The much-repaired castle in Dungarvan, County Waterford. Situated at the mouth of the river Colligan, the castle, prior to the construction of the town’s quays, stood on the water’s edge. It is supposed to have been built by Prince (later King) John during his first visit to this country in 1185. The castle has a polygonal shell keep with a series of corner towers and in the 19th century was used as a barracks for members of the Royal Irish Constabulary. Some months after they had left the premises, it was burnt out by anti-Treaty forces. Subsequently restored, it was used by the local police until 1987 but now contains a visitors’ centre. In June 1732 the indefatigable Mary Delany (then still Mrs Pendarves following the death eight years earlier of her first husband) was staying in Killala, County Mayo with her friends Robert and Katherine Clayton: at the time he was Bishop of Killala. Writing to her sister Mrs Granville, she remarked, ‘About half-a-mile from hence there is a very pretty green hill, one side of it covered with nut wood; on the summit of the hill is a natural grotto, with seats in it that will hold four people. We go every morning at seven o’clock to that place to adorn it with shells – the Bishop has a large collection of very fine ones; Phill [Mrs Clayton’s sister Anne Donnellan] and I are the engineers, the men fetch and carry for us what we want, and think themselves highly honoured.’ It was the onset of a lifelong interest in shellwork that continued after she married Dr Delany in 1743 and moved to Delville on the outskirts of Dublin. Here Mrs Delany decorated various items, including urns and chandeliers, with shells and then in 1750 she turned her attention to the chapel attached to her husband’s house, eventually covering its ceiling with shell ornamentation. In December 1750 she wrote that during the evening, while another great friend Letitia Bushe read aloud, ‘I go on making shell flowers for the ceiling of the chapel. I have made 86 large flowers and about 30 small ones.’ The following month, ‘I am going on making shell flowers, six of the festoons are finished and fastened on; I have ten more to do, and a wreath to go around the window over the communion table.’ Later that summer a little grotto in the garden of Delville received the same treatment. In this activity, Mrs Delany was reflecting the fashion of her age. Inspired by examples from ancient Greece and Rome, the origin of the modern era Shell House can be found in the grottoes that were a feature of 16th century Mannerist gardens in Italy. The Buontalenti Grotto in Florence’s Boboli Gardens for example which dates from 1583-93 has walls covered with stalactites and stalagmites, sponges, stones, and shells; in fact these are not real but were carved by the sculptor Pietro Mati. The fashion for such follies soon spread and in 1624 James I had a ‘shell grotto’ created in the undercroft of the Banqueting Hall in Whitehall. It has long since disappeared and today the oldest extant shell grotto in England is at Woburn Abbey, Bedfordshire which dates from the late 1620s onwards. By the start of the 18th century, the Shell House obsession was widespread and unlike the artifice of the Boboli Gardens, these used real shells. In 1725 poet Alexander Pope built a grotto in the tunnel linking his house and garden at Twickenham. Decorated with shells, glass and mirror shards when completed the grotto was so lovely that the poet sighed, ‘Were it to have nymphs as well it would be complete in everything.’ No wonder therefore that around this time the creation of Shell Houses also began to be popular in Ireland. One of the few extant 18th century Shell Houses in Ireland can be found in the grounds of Curraghmore, County Waterford. As was so often the case, the exterior of the building gives little indication of the richness found within. It has, as noted by James Howley (The Follies and Garden Buildings of Ireland, 1993) the cruciform plan of a miniature baroque church, with walls built of uncut but slightly rounded stones and a stone-flagged roof. As Howley goes on to explain, the interior ‘contains an Aladdin’s cave of rich, shell-encrusted detail on a series of interlocking domed spaces. These are arranged axially around the largest central space, with three circular apses, each containing a window and a small rectangular entrance lobby. Niches are placed between the entrances to the apses and the entire plan is knitted together by an elaborate floor pattern of great intricacy worked in pebbles.’ In the centre of the shell house stands a life-size white marble statue by John van Nost representing the woman responsible for its creation: Catherine, Countess of Tyrone. Most helpfully, a scroll carried in her right hand (her left appropriately holds a conch shell) informs readers ‘In two hundred & sixty one days these shells were put up by the proper hands of the Rt. Hon. Cathne Countess of Tyrone 1754.’ Finding the shells was a time-consuming, and potentially expensive, business, and involved liaising with sea captains and ship owners whose vessels would have returned from overseas voyages. Many of those used at Curraghmore are believed to have been acquired in the port of nearby Waterford city. And planning the design so that it formed a coherent whole would also have been an arduous process: only when sufficient materials had been gathered could the work of putting them into place commence. Seemingly the glue used for fixing the shells into place was a mixture of ox blood and hooves (presumably boiled down). It served the purpose well since most of them remain in place, thereby allowing us to appreciate this rare surviving example of a Irish Georgian shell house. The garden front of Gurteen le Poer, County Waterford. The present house was completed in 1866 to designs of Samuel Ussher Roberts, great-grandson of the 18th century Waterford architect John Roberts. It was built for Edmond de la Poer, created a papal count after serving as Private Chamberlain to Pope Pius X. Count de la Poer was a descendant of Roger la Poer who had accompanied Strongbow to Ireland and was then granted land here by Henry II in 1177. This particular branch of the family remained Roman Catholic and supporters of James II, and after being attainted in 1691 they were denied both the title of Baron la Poer and the main estate at Curraghmore. For the past twenty years Gurteen le Poer has been home to Austrian-born artist Gottfried Helnwein and his family who are at present restoring the gardens. The shell of a former school and hall in Portlaw, County Waterford. Dating from 1854, these and many other buildings in the village were designed by one of the most prolific architects of the era, John Skipton Mulvany. He was much patronised by the Quaker Malcolmson family, responsible for various industrial businesses spread across south-east Ireland including in Portlaw. Once part of a cotton factory complex the present building is listed in www.buildingsofireland.com as being a courthouse, so presumably at some point it also served this purpose. The quality of finish on exterior walls testifies to the building’s high standards but unfortunately nothing of the interior remains. Although disused and derelict, the property is listed for preservation by Waterford County Council. The gardens of Lismore Castle, County Waterford photographed last summer during the annual opera festival held here. The upper section of the walled grounds, the oldest continually cultivated garden in Ireland, was originally laid out in the early decades of the 17th century for Richard Boyle, first Earl of Cork. In recent years it has been revitalised by head gardener Darren Topps and his team. There is no better time to enjoy the gardens of Lismore Castle than in early June, which is when the opera festival takes place and this season’s production – of Donizetti’s enchanting L’Elisir d’Amore – will be perfectly in tune with the mood of these pictures, full of light and colour and sparkle. Very much recommended.